Make a small batch of farm-fresh butter in your own home. 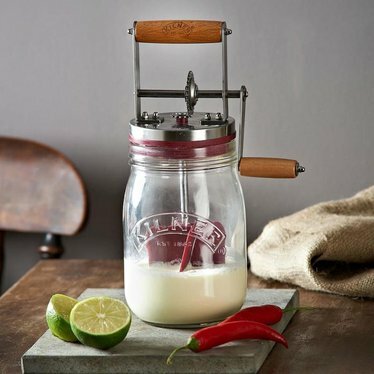 This Kilner hand-cranked butter churner is easy to use, even for beginners. Just put fresh whipping cream inside the jar, secure lid and begin churning. You'll have homemade butter in 10-15 minutes! For Care: Glass jar is dishwasher safe. Hand wash the lid/churning mechanism and air dry completely; do not store away when it is still wet. Helpful Hint: All you need is fresh whipping cream to make butter (best if left at room temperature 1-2 hours before using). Need to replace the jar? We carry replacements! 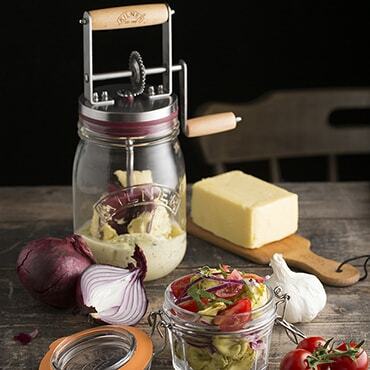 Just look for item #1286015 (Kilner Round Clip-Top 1-Liter Jar). This is my first time ordering from them, but it probably won't be my last. Fast shipping.. packaged well. It takes a little longer to make the butter than I thought, but it was well worth the effort. It has been many years since I've tasted such sweet, creamy butter. All I added was a pinch of salt, and yum! I'm happy to have found this smaller version of my Daisy Churn. I did larger batches of butter years ago but now do small batches. Once someone starts making their own butter, and after a little time..... the store bought variety actually tastes rancid! The only thing I'd change is to make the lid and crank mechanism less "tinny" and more solid. I want this to last as long as my Daisy! It worked good until the 5 th time I went to use it. It started falling apart at the handle where you turn it. I took good care of it & washed by hand. Not sure what happened & am surprised because it has good ratings. Regrets buying it for this price & only got to make butter 4 times!! 5th time I could not get finished, had to use my hand held mixer to help. This is one of the nicest and easiest to use butter makers I have ever used. I love making flavored butters and spreads for my family. After using this one I will never need another. Easy to clean and care for. Stores easily and the way it was wrapped for shipping; there was no way it wouldn't have arrived safe and intact. Very happy with my purchase. There's nothing like fresh butter. Now I'm looking for a better source for cream. I didn't want to spring what to me is big bucks on a butter churn so I bought this one to see if I could make butter and would I like it. Boy, do I. The gears turn smoothly and with ease. It takes about 15 minutes to complete the process from Heavy Whipping Cream to Butter. I get about 3 sticks worth of butter out of a quart of cream. It's not cost effective but if you want flavored butter or all natural butter, this will get you where you want to go. Since I had no one to show me what to do things were a bit tricky and uncertain the first time. Here are some hints: don't give up when your arm gets tired - keep the wheel moving even if with 1 finger to take a little break, it seems like it's taking forever and then you notice thickening - keep going - very shortly you'll see butter - keep going - remember 15 minutes, after you drain the butter milk off (save this for all kinds of things - a cake, my kitty cat like it, to drink) - remember to rinse your butter - yep have a bowl of ice water ready and dip your butter in the water, then drain, rinse, drain, rinse, drain and repeat about 5 times or until the water you squeeze out is no longer cloudy. I wrap my butter in cheesecloth so I can really squeeze the water out. I've heard that since there are no preservatives in this butter it won't keep for months like store bought butter. Use it within 2 weeks. It might last longer than that but I wouldn't know - it's used fast around my house. This little churn turns out about 1 stick of butter at a time. I settle down with a movie or TV program and churn away the minutes. This little churn is heavier and better constructed than I expected for the price. It was bought to show my grandchildren that the grocery store is a convenience, but not where things are made. Our Thanksgiving table will have homemade butter on it! We bought this just to try it out and see if we could make our own butter. It is so much easier than we expected. We have been making many things from scratch and homemade butter is just the ticket. Better taste, better color and takes right around 5 minutes to do. You will not be disappointed in your purchase. Great quality and it really works! Love it! i had been looking for a butter churn to include in my kitchen preparedness kit that was not too large and reasonably priced. The Kilner butter churn is exactly what I was looking for! Great quality for the price in a size that is easily manageable. Churn performed perfectly and I was very pleased with the result. I made a batch of butter using the simple instructions. The churn was easy to use and It did work- just trust it to do its job. It took longer than i expected it would. I used raw organic cow's milk cream. I used the ice cubes plus cold water method for rinsing the butter. I am pleased with this little churn and highly recommend it for making small batches of butter. The butter tasted great and had more flavor and color than store bought.